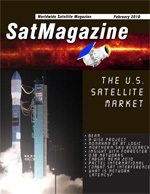 This past year has been rather interesting for the U.S. satellite industry. While some companies have faired extremely well, others have felt enormous pressures descend upon them as global competition works its will upon the various SATCOM segments  most specifically the satellite manufacturing and launch markets  to say nothing of the decrease in capital spending across the globe. Due to budgetary pressures by the US Government, there will be renewed interest in providing new, modernized capabilities through technical refreshment efforts. Upgrading a legacy ground system through a technical refresh offers many advantages over a new-start acquisition. Capabilities can be provided in a timely and cost effective manner. Risk can be reduced by taking a phased approach to adding new, modernized features. Eutelsats new CEO, Michel de Rosen, is settling in well in his new role. Former CEO Giuliano Berretta is now the Paris-based satellite operators non-executive chairman following his retirement from the companys day to day responsibilities. Mr. de Rosen, who enjoyed a long career in the pharmaceutical sector, stressed that in some way he is at a disadvantage compared with incoming chief execs. Long before the term recycle became the buzzword of the times, peddlers of pre-owned satcom equipment were scouring the planet in search of post-warranty treasure  bargain-priced system components scarred from years of faithful service, but with some operational time presumed to still be left on the clock. Notwithstanding the current economic climate, air transport is forecast to double by 2025 according to the latest Eurocontrol figures. And it is abundantly clear that current air traffic management (ATM) systems around the world will simply not be able to cope. To address this issue, as well as issues of safety and security, there are a number of strategic government-funded projects currently running, whose remit is to develop the most appropriate and cost-effective new technologies and techniques for the future needs of ATM. Theses include the Next Generation Air Transportation System (NextGen) in the US and Single European Sky ATM Research (SESAR) in the European Union. For decades, the satellite industry has achieved steady growth by meeting end-user demand for reliable, cost-effective communications for a wide variety of applications. Each day, thousands of corporations, broadcasters, government agencies and other organizations worldwide depend upon immediate access to satellite networks for Internet connectivity, video conferencing, LAN/WAN interconnections, distance learning, point-of-sale transactions and VoIP. United Launch Alliance capped 2009 with the launch of a Delta II carrying NASAs Wide-field Infrared Survey Explorer (WISE) spacecraft at 6:09 a.m. PST, on Thursday, December the 17th. Rocketing from Space Launch Complex-2, the launch was the eighth Delta II during 2009 and represents the 37th successful mission launched by ULA in its first 36 months of operation. Internet data is packaged and transported in small pieces of data. The flow of these small pieces of data directly affects a users internet experience. When data packets arrive in a smooth and timely manner the user sees a continuous flow of data; if data packets arrive with large and variable delays between packets the users experience is degraded. This important broadcasting conference  Higher Value through Digital Broadcasting  runs from March 2nd through 4th and will provide high level information and real-life experiences for those involved in the digital HDTV, enhanced digital radio, and file based production industries. Speakers from MENA and around the world will offer attendees their invaluable expertise. This is a platform for broadcasters and other industry players to exchange views and experiences on launching and supporting HD services. Staged in the city of Perth, AOG 2010 is held annually and has run for over a quarter of a century and is Australias largest international petroleum expo, showcasing the latest technical challenges and solutions connected with oil and gas exploration, production, and transportation. The entire spectrum of the industry is covered, from exploration and production technology to gas processing, pipelines, communications and more.